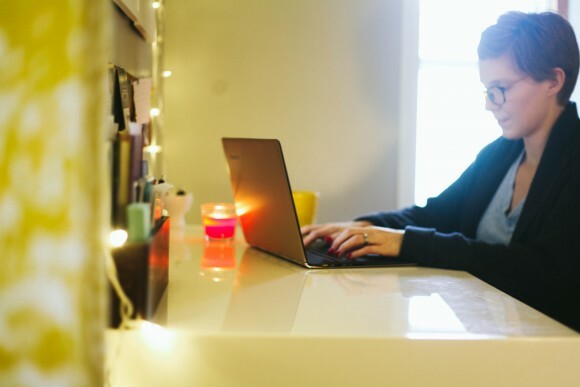 mom life made easier with Lenovo + a giveaway! We all have that one friend who seems to have it all together, right? And while we know that it’s not really possible to have it all together, they just seem to anyway. I envy those women. I am not those women. But I do have some help getting through my day and accomplishing my long, never-ending to-do list and that’s my favorite piece of technology: Lenovo’s YOGA 3 Pro. I’m so serious when I say this magical machine helps me get stuff done. My day starts a little after 5:00 AM as I stumble into my office to get some reading and writing done. 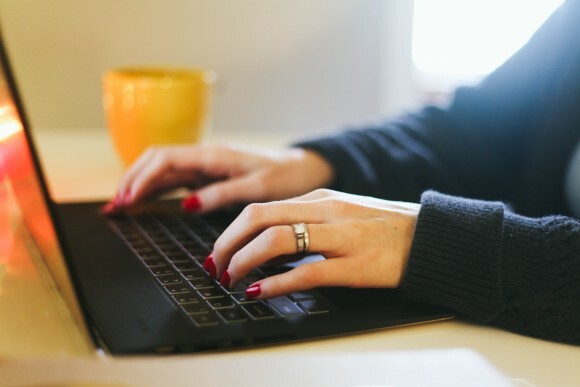 Whether I’m working on an article for a client or a chapter for my book, I need some uninterrupted time for writing and right now, early mornings are where I squeeze that in. 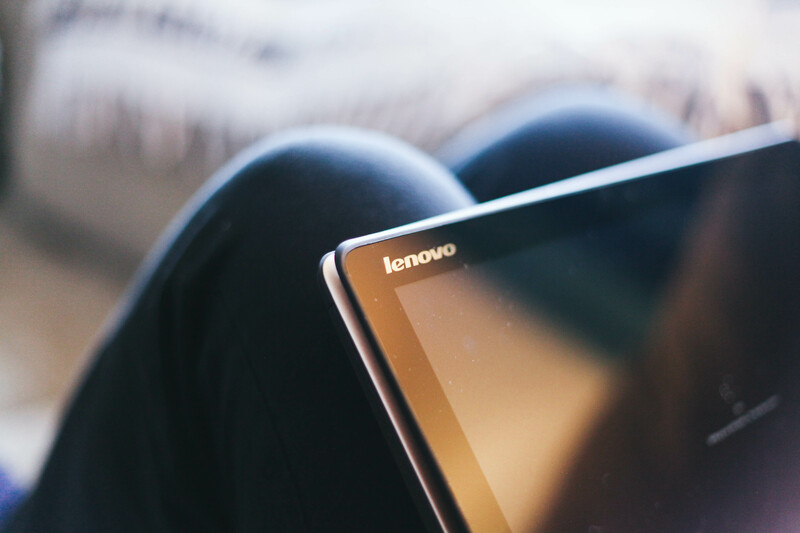 My Lenovo YOGA 3 Pro makes writing at my desk or curled up on the floor in a blanket a breeze because it’s so lightweight and portable. Yes, sometimes I write on the floor under a blanket. Try it, I bet you’ll like it too. After I’m done writing, I head off to school for a day with middle schoolers. When I’m done with teaching, meetings, and grading a million papers, I head home for dinner and dance parties with my girls. I love the ease in which the YOGA 3 Pro transitions into a tent set-up so I can check out recipes with the touch screen as I’m preparing dinner. Or as I’m taking princess dance party breaks as dinner cooks in the oven. My daughters plan on being princesses when they grow up so it’s very important that we practice our dancing daily. The speakers on the laptop have great sound quality and will be great to use in our castle one day. After dinner, homework, baths, and bedtime comes my favorite part of the day: snuggling up on the couch with a good show, my husband, and our dog. I’m going to be honest and say that I often fall asleep once a show starts, but being able to watch something on my laptop that can morph itself into a tablet is pretty great. There’s no need to buy any other technology, the Lenovo YOGA 3 Pro does everything I need it to. Being a mom is exhausting in the best possible way. 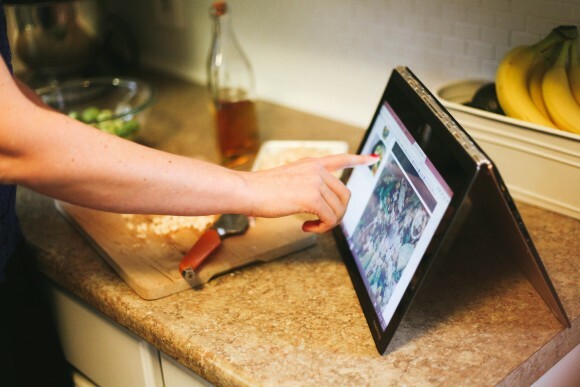 I love our full life and how the YOGA 3 Pro fits into it. It helps me get my to-do list done and helps me relax after everything is marked off that list. At the end of the day, it’s all I need in a laptop. 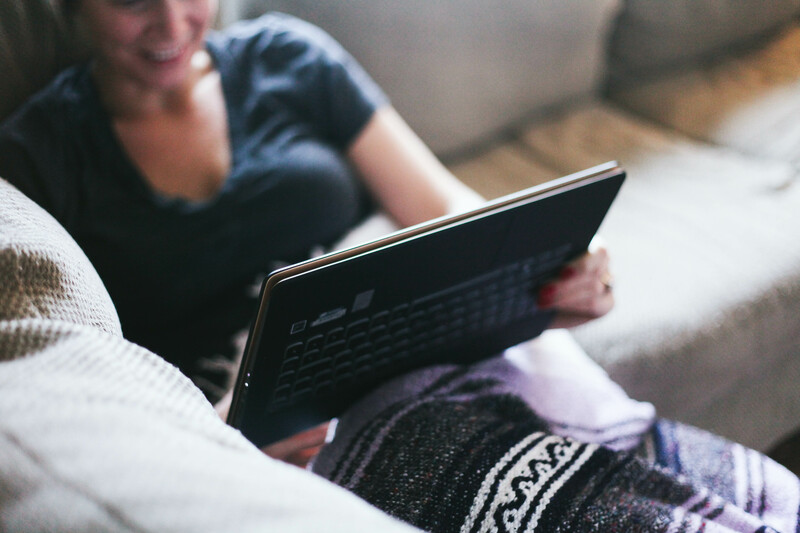 Forget being a mom that does it all, I let my Lenovo YOGA 3 Pro do it all for me. I was selected for this opportunity as a member of Clever Girls and the content and opinions expressed here are all my own. Photographs by K. Meeks Photography. I think generally just being able to move around with it would be so nice. Right now, I have to remain plugged in to get anything done. Which, with kids is kind of a pain! I love the sweet kitchen dance party pictures! Fun moments! My husband had a lenovo yoga computer and I ALWAYS steal it. It is so versatile and easy to use. I would like to win one 🙂 Love following your blog and following along on your weightwatchers IG account, too! You are an inspiration. Love the full keyboard for easy typing and working, but the tablet feature is great for on the go! The lightweight, flexible Yoga 3 Pro would make my life so much easier because it could go anywhere and could replace many of my other existing devices. The portability would make my life easier – having one awesome device that is portable and could replace 3 or 4 others would be amazing! We bought a tablet last year, and my husband loves it, but that’s the problem! I never get to use it! I love using pinterest or online recipes when I cook, and I also have 2 dancing princesses in my home, so this would get a LOT of use! I love the versatility of being able to move from a computer to a sleek screen. Being able to grab it and take it anywhere would be so nice! Love the versatility of this Lenovo. I currently have a laptop but not near as easy to transport as your Lenovo. Love all the uses for based on the features. Would love to be able to take this anywhere and use it. Thanks for the review and the chance to win! It would help me with recipes when I cook! It would be so nice to have everything in one place for on the go. I mostly use my iMac in the basement office, but for just hanging with the kids, I have to use my laptop because it has to be plugged in. It would definitely make blogging more easier, since I will be able to blog from just about anywhere. This would make my life easier because I don’t currently have a laptop or any way to do work that requires lots of typing/a bigger screen other than my desktop. This would introduce so much flexibility and portability into my work. I need a new laptop because my old one was killed by Febreeze! (My son thought it needed to be cleaned…) It would be sooo much easier to write and edit with one of these! The he Lenovo YOGA Pro 3 would make my life better by giving me a cool way to organize my life and stay in touch. Thank you for the wonderful giveaway. A new laptop that functions better and has way better features like this one would be great. The one i have is a little slow and has not be too good for me lately. And it is too bulky. This would be perfect with all the wonderful features! It Would help me keep connected when on the go. It would make my life easier because I currently dont have a laptop, it would make my life easier on the go. It would make my life easier because right now I have to plug my laptop in or it completely dies out. Poor thing is old. It would be so nice to have something light and versatile that I could take with me on the go to work, play videos for my daughter, share pictures and home videos with extended family, and more. It would allow me to stay better organized with that cool evernote! The Yoga 3 Pro would make my life easier because as a student with an almost full-time job, I need a portable laptop to use for research, papers, email blasts for the store, and leisure activities like watching Netflix! My laptop is about 6 years old and pretty slow and heavy, so I really hope I win! Thank you! The portability and the power of the Yoga would fit right into my busy lifestyle. A wait at a doctors office could be time spent getting things done. My life would be easier (and probably different) with the Lenovo YOGA Pro 3 because I’ve never had a laptop computer. I’d take it into the kitchen when i need a recipe. I would love a versatile, lightweight laptop that also turns into a tablet or tent or whatever I need it to be at any given moment. I would love to win. I carry my laptop everywhere so that I can write whenever I have a spare moment. The Yoga is so light it would make my life so much easier. This is so small and lightweight that it seems easy to carry everywhere! It could entertain my son in a long car ride, travel with me to the kitchen (recipes) and cuddle with me in bed (Netflix). I will give me a more portable computer. 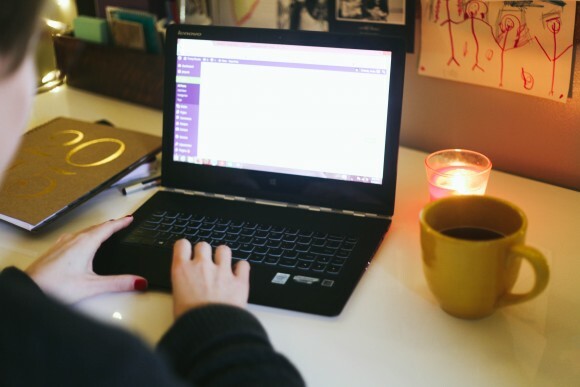 I believe the YOGA 3 would help keep me more organized and on track in my everyday life. I would totally use it to watch a lot of my lecture videos and use it to take notes! I love how portable it is, but also has a good sized screen. I have a 7″ tablet that is hard to see even with reading glasses on. I’m always needing it to help my boys with homework. This would certainly enhance my life. Oh this would be so wonderful for our family! Our laptop did last year, and I miss it so much! I would love to use the calendars to get organized again! I would also love to use for budgeting, cooking recipes in the kitchen without having to run to the desktop every 2 minutes…..and when we travel to relatives! So many great features it has! It’d help me in the kitchen for sure, maybe inspire me to try some new recipes! We only have a desktop computer so the portability would be awesome when I travel. Thanks! The size of it makes it so portable and easy to travel with. This Lenovo will make my life easier because it is so multifunctional. I can use it for work, fun, and general task mastering. It’ll help me be more productive because it has a speedy processor, lots of ram, and solid state hard drive, so I’ll spend less time waiting and more time typing or actually using the laptop. My current computer is on its last leg and it would help so much to have a new one to get caught up on all my orders and book keeping! It would be so much easier to have a tablet and laptop in one, especially one that is portable and lightweight and has a long battery life. This would definitely cut down on the nightly fight for the computer! My boys are getting older and need the computer more now for school work. I am grateful that we have a laptop that works – but it is over 10 years old, large and heavy. The battery is pretty shot, so it needs to be plugged in all the time. The Yoga with its “portability” would be fantastic ~ can you imagine how much I could get done during lunch at work or while waiting for appointments? Very cool that you were sent one for yourself! Fingers crossed here! I have the first Yoga. Having a new one would make me even more productive! I would use this for both entertainment purposes and to help me stay organized. This pretty,chic laptop would be so great for making my load easier in my pre-nursing studies! I love how multi functional this is and how you can use it many different ways! I currently have a PC but I am in need of a potable device for my schooling. Hope to win! I could organize so many files, accounts & my google calendar on this! Love the pictures and the giveaway seems AMAZING!! This would be AMAZING for my travel bogging I have upcoming and just general ability to work around my house not stuck to a desktop! I like that it has the ability to be a “computer” so that I could write blog posts anywhere! So much more convenient than my bulky laptop! It would make our trips a lot easier. They could use it as an ipad in the car and a laptop for homework in the hotel. My children compete in sports so this would be great! This would make my life so much easier because this is so easy to transport! I’ll be able to get more work done being able to carry this around with me! This laptop would be killer. I am on the Tone It Up Bikini Series and I am constantly hauling my iPad into the kitchen. Having the ability to type faster to look up recipes and flip the laptop over for scrolling would be so much easier!! It will replace our now slower computer and make the wife happy! I love how versatile that tablet is for on the go! I love that it has a full keyboard, but is also very portable – and that it can sit up on the counter for when I’m making dinner & need to reference a recipe! 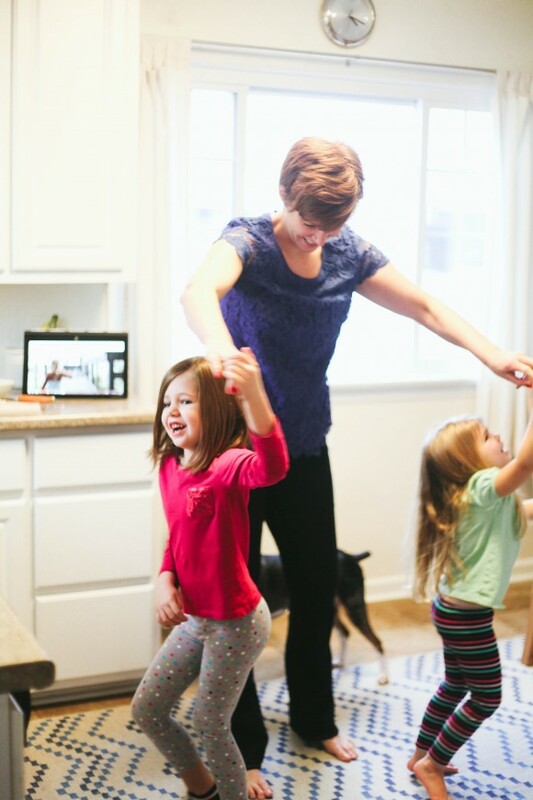 The yoga 3 would allow me to get my work done while still being present with my kids. I can squeeze work in between family time. Having one device to store and organize all of my things would make my life 100 x’s easier! I am a mom and a college student. This would make it easier to do my college work from home. Good luck to all and continued success to you, Mary. Always a good (and relatable) read. I’ve been following you on IG for awhile now and periodically check your blog, so cute and inspiring! I’d love to win a yoga pro! i like that its lightweight and a touch screen, it would make my stay at home job a little easier to do white taking the kids back and forth just plug in my cell phone and go! I like how it’s a laptop for serious computer work, and it’s a tablet for fun work. Life would be so much easier to be able to take it as a tablet on the go and then flipping it to a laptop at home when I need to do a lot of typing. It would make my life easier being able to better review photos I take for graphic design projects. I would be able to balance my work life/emails with my fun life- social media, movies, music, TV shows. It would make my life easier because I don’t even have a laptop. I wouldn’t have to be tied to my desktop all the time if I won! I would be able to take the laptop/tablet on the road with me to blog and enter sweeps. We’re transitioning into a TV free family, a Lenovo would allow me to better limit screen time while promoting family time with family games, books,etc. It would make it easier to follow recipes I find online. THE SIZE IS PERFECT TO TRANSPORT EAISLY. I LIKE THE TOUCH SCREEN AND TENT MODE FEATURES. It would make my life easier in the kitchen with the versatility of the screen. My Lenovo would make my life easier as I don’t even own a laptop and this would be great when I’m on the go being a care taker for my mom. Thanks for a great giveaway! If I had the Lenovo Yoga 3 Pro It would make my life easier because I wouldnt have to share a laptop with the hubby! This would make my life easier by allowing me to work from anywhere! This would be great to bring to work and also for recording my recipes, taking video and watching videos. This would make my life so much easier! I watch my little 3 year old grandson daily. We could use it for educational games. I also would like to use it when I can’t get to the desktop. So many things I’d use it for like cooking/recipes and keeping in touch with family on facebook, to mention a few. Thanks for the chance! 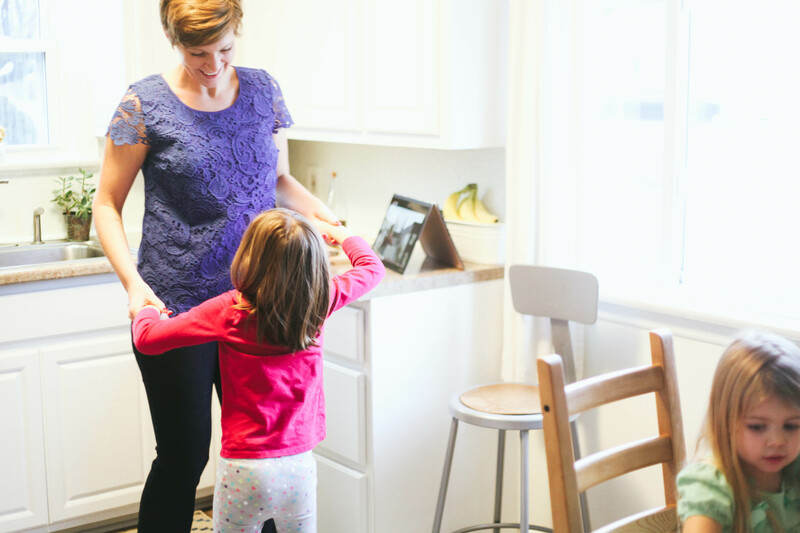 The Lenova Lenovo YOGA 3 Pro would make my life easier because of it’s lightweightness and easy mobility, I can multitask with my little ones and especially my walking toddler who keeps me going. It will also give me a chance to watch some of my shows and read my favorite blogs (trustychucks.com being one of them) when winding down at the end of the day. It’s also great for entertainment, music and writing. Crossing my fingers for the win! Wonder if I’d finally finish my book if I had this to type it out on? Instead of 14 random notebooks piled in an old pocketbook under my desk? Of course, I would! It’s the coolest thing ever! It is so light and small I wouldn’t need to lug my big briefcase to clients! The looks aren’t bad either – much cooler – I would feel younger. At home the convenience would probably have me taking it everywhere and we have a blank wall that would be cool for movies. Being able to take it anywhere, it would really help me to do my school work more easily. The weight would definitely make it easier to travel with; easier to plan meals (researching recipes), organize and plan. This would help me keep up with our business on the go, stay better organized, and doing creative, fun things with the kids! I commute via public transit so a lightweight laptop/tablet hybrid like this would make my life easier by letting me get work done on the train! I’m always on the go and have been looking for something portable but I’ve shied away from tablets because I love keyboards and didn;t want a separate accessory! This would be perfect for my constant travelling. I’m going back to school in July for my associates in Psychology and desperately need a working laptop since my other one broke!! I’d use it for everything, but mostly to entertain my grandkids! it would make life easier for me because it is thin, flexible, and lightweight-all things I need in a laptop. Plus the projection feature would make family movie night lots of fun! The projector would allow us to have movie night outdoors under the stars. This laptop would make my life easier with my kiddos and traveling. I love the portability of it. I’m also working on a new business and this would help so much!! I love baking, so this would help me find recipes online and be able to read it easily off the website right in the kitchen. I work for the American Cancer Society and travel daily for work. I’ve been looking at convertible laptops to simplify my life. This could be an answered prayer, especially if it is as wonderful as you say! I wouldn’t have to share a computer with my roommates and could get my assignments done a lot quicker. Awesome to have for productivity. Love the projector feature, too! This would make my crafting alot easier because I would have to worry about where to put it while I have to use my hands for crafting or doing recipes. My computer is so slow and old that this would make using the computer alot easier and faster. Thanks for the chance to win!!! My life would be easier with the Lenovo YOGA Pro 3 since I would be able to check my emails, Facebook page and Twitter when we go camping and traveling. We go camping once a month and visit our sons away at college. I presently am using my cell phone which is small and strains my eyes. Great 2 in 1! Features are awesome! Thanks for the chance to win one. Perfect timing since my current computer is crapping out on me!! And winning this computer would be a dream! I’m a mother of 3 and this would help me so much. I am constantly looking up new recipes, crafts, and activities for my children and the children I watch. This would also help me with the launch of my new blog. This would make my life so much simpler. I would love to be able to compute on-the-go! The Yoga Pro 3 will make my life so much easier by helping me stay organize, help me prepare healthy food for my family and be able to help my son with his assignments (plus the fact that i can use it to have my own me time enjoying a movie or tv show right in our bed – love the portability of the Yoga Pro 3). the possibility of it helping me and my family is definitely endless! This would make my life SO much easier. I carry a heavy laptop to and from work everyday, and on business trips! This would be so much easier to carry with me. Plus, half of my keys on my current laptop don’t work, so I have to use an external keyboard! I could keep all of the pictures and videos of my grandsons organized. The lightweight, flexible Lenovo Yoga 3 Pro would make my life so much easier because I could take it with me and do my school work on the go. I could definitely get more done without having to borrow my son’s laptop. It would make it easier for me because how it is handy as a tablet and how flexible it is. It’d make my life easier because the whole family could use it in various parts of our day. It would make it so much easier to take my work on the go! With this wonderful laptop I could skype and keep in touch with both of my grown children, stream my favorite shows, listen to my music, and research my passions, cooking and gardening. Being a small business owner and a mom of three busy kids, the ease and flexibility of the Lenovo YOGA Pro 3 would make my life so much easier! I would be able to easily take my work with me while running with the kids. I would be able to maximize my time by getting work done while waiting for practices to get done or waiting between games. The fact that it does so much would make life easier. Everyone in the family would love using it. This would make my life easier because I’d no longer have to carry around my bulky 5 year old laptop! This would make my life easier because my laptop is dying and I do not own a tablet. the yoga will make life easier by giving me a portable computers. This would be perfect to bring to my classes! I love the versatility of the Lenovo!! I going to back to school and this would help me be able to get my work done anywhere and anytime! This would simplify my life because I could chuck a number of the other devices that I’m using. This is so light that it would be able to go everywhere with me! A powerful, light, multi-position-able laptop with all the new bells and whistles. Yeah I think it will simplify my ‘6 lb laptop or the less useful tablet” life choices. The build in projector would make family movie night so much more fun in our home. It’d help me stay organized and get more things done while on the go. The Lenovo YOGA Pro 3 would make my life easier because I would be able to smootly go through my day with the speed and how versatile it is. i would use this for work and play! i love the tent feature for watching videos- I’m a netflix junkie. It would make my life easier because I could take it to work and then bring it home to use. I’m starting a new blog and a Yoga would be such a help! This tablet would help writing blog posts so much easier. I wouldn’t have to drag a cord around the house and it would be always next to me. It would make it easier to carry around a laptop for use during commuting. The one I’m using is just too heavy. I would be able to take my eBay to a whole new level because I mostly use my smartphone and some of the features are hard to do. It would make everything simpler. I’d love to be able to get out and about with this. Right now I just have my desktop. It would help me to have more options because I don’t currently have the ease of portability or long battery life. The versatility of the Lenovo 2 in 1 would help me be more productive in the things I had to do both online and offline by providing a higher level of convenience. I love how portable the laptop is and as a new mom that is key! It would make my life so much easier. Right now we are all sharing 1 PC! The kids would be able to do homework at the same time! This would help me with my new fitness program. I could look up healthy recipes, watch fitness videos and keep track of my progress. Lenovo Yoga Pro 3 would make my life much easier this August when I head back to school to start my 2 yr journey to get my Masters Degree! I am in love with this laptop and amazed my all its features and capabilities! The Lenovo YOGA would make my mom’s life so much easier because she’d finally give up her dinosaur of a desktop. If I win, I’m giving this to her! I am a young Real Estate professional and it would be SO helpful to have something that I can put in an over-sized purse or small work bag to take with me when I travel (which is a lot)! I would love to be able to send emails on the fly, make impromptu investor presentations and take pictures with one item! I would be able to make a living from anywhere in the world. Currently I have a gigantic desktop that I can’t even read the screen because the setup is so old. this would be great. C needs one for high school. The kickstand function and the 7 hours of battery life would be helpful. I would also get a lot of use out of it for the projection, helping the kids with homework, movies, games and entering giveaways! As a blogger, I could use a more flexible laptop. My current one is so old and slow. The Yoga would free me from my desktop and let me get more done when I’m on the go – traveling, at appointments, on the couch. I love the long battery life too! The Lenovo YOGA Pro 3 looks like the perfect upgrade from my current laptop. It is the perfect blend of power and portability to tackle my work applications and entertainment. I LOVE the projector! What fun it would be for backyard movie nights. I use my laptop for everything from the business to running the household, to social media and entertainment. I bought a Lenovo 8yrs ago online and it has served me well. It now is so outdated though I can’t even access instagram and share because I don’t have windows or apps. I am currently running Vista. I now get pop up box’s telling me I have low disc space but after 8 yrs I’m sure it’s maxed. I also freeze often and have to reboot because of plug-in failures. I have used and abused this Laptop and it has just took the beating and kept right on working. I was unwilling to upgrade until I could find something that I would love as much as the one I have now and I just wasn’t impressed with any until today. The Lenovo YOGA is amazing! It just blew me away. It has so many fantastic features. The hinge, is ingenious. The hanger well that’s just so handy. The projector is awesome! I could see outdoor movies in my future! I not only want this fantastic Dream Machine called the Lenovo YOGA I need it. Thanks for Caring & for Sharing! It would make my multi–tasking life SOOOO much easier… Everything I need and use all in such a portable device! The Lenovo YOGA 3 PRO would make my life easier because its a 2 in 1 laptop, that’s light enough to be carried anywhere and multifunctional enough that it can do it all anywhere too! I love the tent feature for watching or streaming videos and movies, and that this YOGA 3 PRO is light enough to carry as a tablet while still usable as a laptop for your desk too. It would be very helpful for me in any of my online and day to day projects! Thank you!! This would be perfect for me! I am always on the go and my laptop is just too bulky! If I had a Lenovo my life would be so much easier because I could get so much work done. I think it would be great to travel with since it’s so sleek and portable! Just being able to have one device that fits all my needs that is easy to take along anywhere…. I’m entering medical school this year, so it would be perfect for carrying around! Plus it’s super versatile. I love how portable/flexible it is I could take everywhere with me. It would be so awesome for everything from doing my budget to cooking. The Yoga would make my life so much easier by replacing my slow and clunky laptop with something fast and modern. My laptop struggles just to load simple webpages, so accomplishing anything online is frustrating and miserable. The Yoga would clear the headaches away! Just accomplishing daily life would be easier given a device I would use for school, work, and fun. The Lenovo would make my life easier as I could carry it around the house and travel with it while staying in touch with family and friends. I could use it in the kitchen to access my online recipes, take it while I travel and just enjoy it at home to replace my old dinosaur desktop that is slower than a turtle. Woah! This has a ton of comments! I always appreciate to learn how you do it all Mary, and I did think that we were one of “those women.” 😉 I need as much help as I can to be organized and efficient. 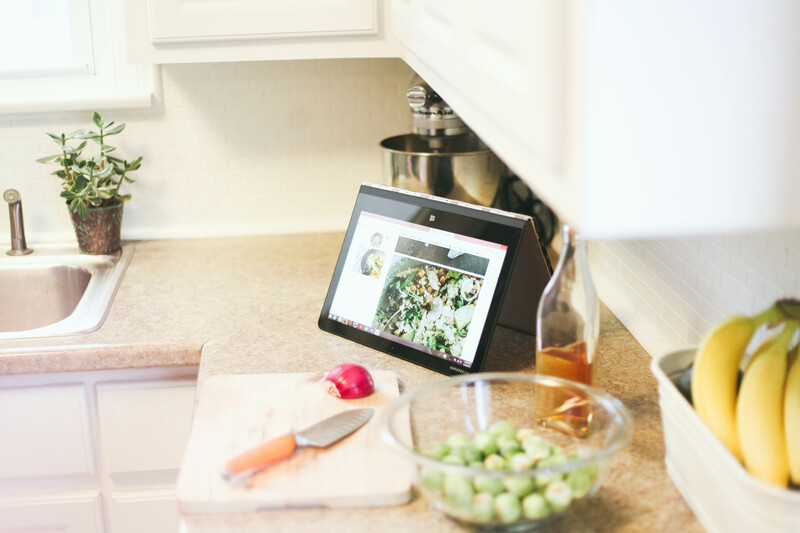 I am always using the laptop in the kitchen for cooking- i like how this has the kickstand like function, and a tablet, too! Thanks for helping us make our lives better through your encouragement and blogging.